Anyone for a crispy chicken? Hundreds of computers in town, printing services availaboooool right next door on Moi Avenue…and these guys just can’t get their signboards written on a normal piece of paper in clear letters. But then – this also works…. There was this guy on Moi Avenue who tried to address some political issues and the reason I took the pic is because there were NO women around, ONLY men. What’s the rule of the road? Didn’t they have their office located somewhere else? Well, they shifted their business “round the corner” and I think this way it’s more convenient and more attractive. 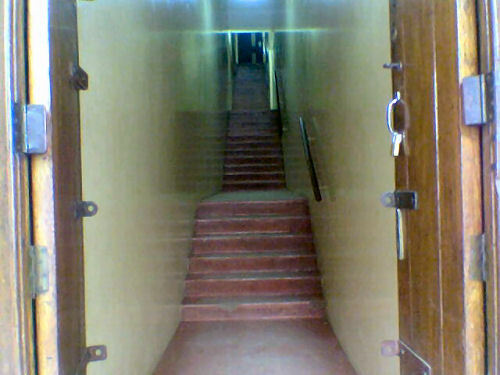 …a staircase somewhere on Biashara Street…. ==> I know it takes ages for some readers in Nairobi to load these images, but please, dear Kenyan bloggers in Nairobi – could you please take more pictures and post them on your blogs? Thank you! Lovely pictures…JKE, i trust you enjoyed yourself? Kiku: Ahsante sana and this has brought back so many memories , even “kuku Mfalme” LOL… Ati ROCKY = Hsopital Ceiling are Boring, drive safely -LOL .That is classic ! 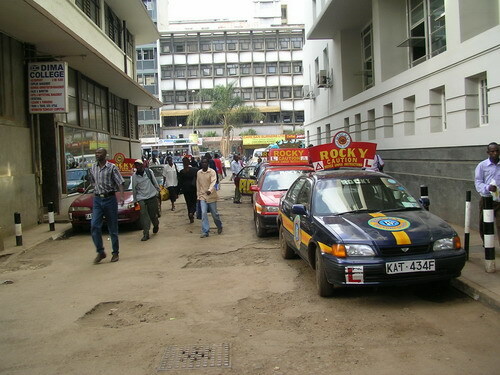 It is so cool to see Nairobi and wananchi hustling = priceless. That relaxed atomsphere is what I yearn so much but not to say things should not be done with speed /punctuality! “there were NO women around, ONLY men.” Obvious, women are busy hustling to feed the family…woii what did I just say? I am soooo hungry for Farmers’ choice sausages and that chicken. And like Irena said the women are doing the REAL WORK. THANKS FOR THE PHOTOS DUDE!!!! Now let me go back and check them out!